EVEN IN GOOD TIMES, the rumors were frequent and often negative: Sino Land was paying too much for property. It was overreaching its limited capital base. It was threatening to default on loans. And yet, the company always seemed to pull a rabbit out of its hat, posting profits and proving the naysayers wrong. But when whispers surfaced again recently and the company's stock price on the Hong Kong exchange dove 45% in one day, the problems, this time at least, seemed all too credible. Company officials fought hard to counter the bad vibrations. Sino Land Chairman Robert Ng Chee-siong, son of Singapore tycoon Ng Teng-fong, said speculators had spread the rumors: "If people are short in the market, they want to knock [the stock price] down. In the process they spread malicious rumors. The rumors of default are groundless." The damage-control helped a little. 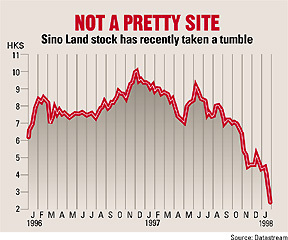 Sino Land's stock price recovered slightly in the days after the plunge. And yet, suggestions that the company has been hurt by the region's economic woes are at least based on facts. Sino Land, the fifth-largest property developer in real-estate-crazy Hong Kong, has long been considered the most audacious of the city's big developers in its willingness to pay exorbitant prices for raw land. In fact, the Ng family's private real estate holdings and property subsidiaries may well make it the biggest property group in Asia outside Japan (the family's Far East Organization is the largest property owner in Singapore after the government). But, to a great extent, the Sino Land real estate empire has been built upon leverage -- debt is 51% of equity. That is a problem when your currency is under attack by speculators, as it is in Hong Kong, and your government's main defense is raising interest rates. "There is an across-the-board concern growing on how Hong Kong developers will fare in an environment of rising interest rates and falling property prices," says Otto Wong, property analyst for the Jardine Fleming brokerage firm in Hong Kong. "Smaller but aggressive developers like Sino are in a much more sensitive situation than their bigger counterparts." In fewer words, Nikko Securities in Hong Kong agrees. Shortly after the Sino Land stock drop, the firm reported that the company still wasn't a good bet. Nikko said it couldn't advise investors to buy even at a bargain-basement price: "[Sino Land] has always been perceived as a high-risk stock, even in the good times, so we are not recommending purchases." Why has the company that almost single-handedly revived confidence in Hong Kong property after the Tiananmen Square crackdown in 1989 become the object of such skepticism? Sino Land's problems seem to be rooted in its fundamental method of doing business. After Tiananmen Square, and again in the aftermath of a 1994 property slowdown in Hong Kong, Sino Land eagerly spent top dollar for real estate. Again and again, Ng bid the moon for property and was later vindicated when a soaring market caught up and passed him by. Ng laid out his strategy succinctly: "Property is a long-term game. Always buy with the next upturn in mind." The strategy worked, especially because Sino Land was able to develop property far quicker than competitors. The speed, however, wasn't always appreciated by tenants, who at times complained about the finish and upkeep of Sino Land buildings. Investor sentiment was more volatile: The stock has dipped and soared several times over the years. But the current slump represents a new challenge. Since Sino Land develops and then sells properties, it does not have a substantial rental income stream with which to service ever-higher debt, and it must rely on purchasing land at government auctions and then quickly developing it to make money. On the plus side, Sino Land is not as exposed to the office and retail property sectors, which are being hit especially hard in Hong Kong, as some rivals. In the opinion of experts, Sino Land's run is not at an end. True, Hong Kong's property market is ailing: prices are down about 20% since October, and some experts predict a similar decline this year. But Wong believes Sino Land will be able to weather the storm as long as interest rates don't go up too much more. His main concern is all that leverage. Company officials insist their cash flow in 1998 will be easily sufficient to service debt. But Wong says significantly higher interest rates could change the equation. If that happens, Sino Land may need to pull another rabbit out of its hat in 1998.